Last week I filled out our annual organic certification paperwork due February 15th. It’s one of those items on my To Do list that I often put off. When a farmer wants to be an organic grower and label her produce organic, each crop on the farm must be certified by a regional certifying agency. First, the applicant needs to demonstrate that for three years the land has been free from contaminating chemicals. Then, the crops must be grown according to organic standards; specifically, any material used on the crop must be on the Organic Materials Review Institute’s (OMRI) list of approved materials or individually approved by a certifying agency. If a farmer chooses not to become certified, yet still follows all the regulations, she can tell customers that the crop is grown according to organic standards, but cannot label it organic. The standards are stringent, and the United States Department of Agriculture can slap on a fine of up to $10,000 for each infraction. Now that I am filling out the certification papers for the 11th year in a row it doesn’t take me as long as it used to. But I remember the first year I nervously submitted our thirty-page application, including maps of the land, a soil report, a list of materials I had used or planned to use, and harvest, selling, and storage plans. The certifier wanted to be sure that there was no possibility of contamination at any step in the process of delivering the crop to the consumer. The final requirement before receiving certification was the annual onsite inspector visit. I knew that being certified would create our market. 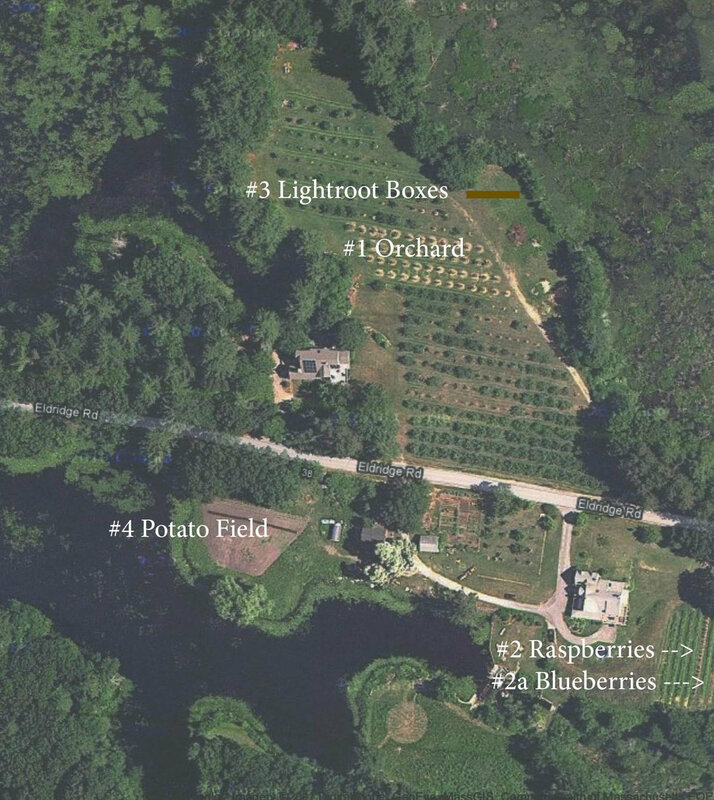 Our certifier had told me that there were no other pick-your-own certified organic orchards in Massachusetts. Without it, why would anyone be attracted to our little farm, when we were surrounded by so many commercial orchards that not only offered apples, but cider donuts, farmstands, mazes, petting zoos, and hay rides — big time agri-tainment? On the day of our appointment, the inspector arrived with copies of our application and a clipboard of questions. He wanted to see the shed where we stored all of our materials, the tractor, the sprayer and other tools, our spray log, and receipts for all materials purchased—in short, everything related to the farm operation. It was a bit like having a nosy mother-in-law inspect your domestic abilities. I thought I’d done everything correctly, but the inspector noted some inconsistencies that needed to be addressed before the orchard could receive organic certification. We called the company numerous times and sent beseeching emails. Fortunately, we reached a sympathetic person who explained that the product was changed to a different label due to a “consolidation of product line.” Neither the active nor inert ingredients had changed. He said the company didn’t list it because the paperwork was so arduous. We were very appreciative and the farm officially received organic certification a few weeks later. Now, I get approval for every product before I use it in the orchard. And because we are one of two organic pick-your-own orchards in the state, and still the only one in eastern MA, we are picked out every fall before Columbus Day. Today, I wouldn't consider spraying a harsh chemical on our trees or herbicide under the trees, but I continue to apply for certification. Organic certification creates the market for our small farm. But I know that organic is only a minimum requirement for healthy food. The nutritional content of our food makes the big difference in human health and it’s the biological activity in the soil that feeds the plants that feed us. I’ll be writing about nutrient dense growing in a future blog. But that’s why it’s important to know your farm and know your farmer! Tantalus was a rotten apple! An invited guest on Mt Olympus, he stole nectar and ambrosia and brought it back to impress his friends. But that wasn’t the worst. Later when the gods came to dine with him, he cut up his own son, Pelops, boiled him, and served him to his guests. The gods suspected something was off with the menu and declined to partake; but poor Demeter, distracted by the loss of her daughter, Persephone, took a bit of shoulder. Zeus ordered that the parts of Pelops be collected and that he be put back together. Hephaestus made him an ivory shoulder, and he grew into a handsome youth, married, and had children of his own. Zeus killed Tantalus and then punished him further by making him stand waist-deep in water while overhead he was shaded by a large apple tree ripe with fruit. However, whenever Tantalus went to drink the water, it dried up; and each time he tried to pluck an apple, the wind blew the branch out of reach. He was trapped inside perpetual desire. Orchardists desire a beautiful, abundant crop. They worry about the crop all year long. There’s no off-season. Weather can freeze the buds or the blossoms. Even the almost ripe fruit can be the unlucky destination for thirty seconds of hail. Then the apples will be pock-marked and susceptible to disease. Yet, still, growers of apples persevere. There’s something about growing fruit that challenges the soul. And the best part is that it requires hands-on attention. How surprised I was to learn of a robotized apple picker being developed by Abundant Robotics, Inc. The picker will be drawn by a tractor with nozzles reaching out, up, and down, vacuuming the fruit off the tree. Each step of progress seems to take humans away from touching what we do, touching what we grow, automatizing our lives. Touch is a profound human experience. Think of an infant and how these two senses, touch and taste, are the foundation of her first relationships. When I first saw the advertisement for this small farm in Harvard, MA, it said five bedrooms, a detached garage/barn, apple orchard, and a chicken coop. At that moment in my life, I was unsure about everything. I had never before contemplated owning a house, but I had to find a place to live. I wanted a place that would have rooms for my three children and a studio for making sculpture. I walked with a realtor through the kitchen where dark pine boards covered the walls and ceiling. There were no drawers or cabinets, only open shelves for plates, bowls, and glasses. Above a wood-burning cook stove hung a patchwork of blackened iron pans. This was a real work kitchen. We walked upstairs and I thought, If the house has hot water, everything will be fine. In the master bath, I turned on the hot water faucet in the 1960s avocado-colored sink. Warmth ran over my fingertips. Maybe because I am a sculptor I trust what I feel with my hands. That touch of warmth gave me the confidence to move to the farm. But I had no idea that once I started to grow apples, I would become like Tantalus, desirous of plucking more and more fruit. Even with extreme shifts of weather and unexpected environmental conditions, I persist. In winter, walking through the orchard, bending down the branches, pruning off what is no longer needed, and running my fingers over the frozen fruit buds, I fall again in love with the promise of fruit. And after a full day pruning in the winter cold, I sit in my favorite armchair and read the descriptions of heirloom and modern apples in my stack of saved nursery catalogues. I can’t help but be tantalized. I order a few new varieties for spring planting — a perfect Valentine's Day gift!